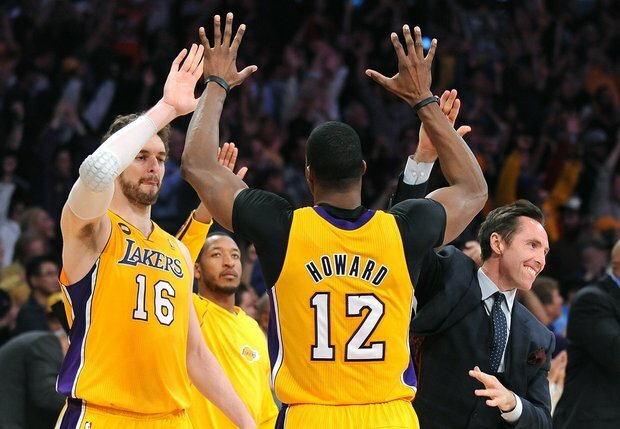 Lakers beat Houston 99-95 in overtime to end up at 7th in Western Conference as Jazz loses to Grizzlies by 70-86. Steve Blake scored 24 points, Pau Gasol added his 7th career triple-double. Steve Blake scored 24 points, Pau Gasol added his seventh career triple-double, and the Los Angeles Lakers secured the seventh playoff seed in the Western Conference with a 99-95 overtime victory over the Houston Rockets on Wednesday night. Dwight Howard had 16 points and 18 rebounds, and the All-Star center blocked James Harden's shot in the final seconds of overtime for the Lakers (45-37), who only clinched a playoff berth about 10 minutes before tipoff in their season finale. After winning once more without Kobe Bryant and Steve Nash, Los Angeles will face second-seeded San Antonio in the first round. Chandler Parsons hit a tying 3-pointer from three steps behind the line at the regulation buzzer for the Rockets (45-37), who will face top-seeded Oklahoma City after losing four of six to end the regular season. Harden scored 30 points and Parsons had 23 for the Rockets, who already knew they were back in the postseason after a three-year absence, but could have ended up in three seedings depending on Wednesday's results. Houston had a shot at the No. 6 spot before Golden State beat Portland earlier, but Los Angeles holds the tiebreaker on the Rockets. Gasol had 17 points, 20 rebounds and 11 assists in his second triple-double in three games for the Lakers, who also held Houston well below its NBA-best average of 106.1 points per game. After a rocky regular season, the Lakers are heading into the playoffs with five straight wins, and eight in their last nine games. The Lakers even won twice without Bryant, who tore his Achilles tendon last Friday and watched another game from his home in Orange County. Nash hasn't played in eight games with a hamstring injury, but the Lakers finished the regular season with a gritty comeback win despite Chandler's heroics. Houston led for most of the night before the Lakers went ahead with 6 1/2 minutes to play, but both teams struggled offensively in the final minutes before Parsons ended up alone with the ball near midcourt in the final seconds after a broken-play scramble. His desperate 3-pointer had almost no arch, but dropped in to force overtime. Neither team made a shot in overtime until Gasol's jumper with 2:26 left, ending a field-goal drought of more than eight minutes for the Lakers. After Jodie Meeks drove the baseline and dunked in the final minute, Howard stepped in front of Harden and blocked the Houston star's drive with 20 seconds left. Blake and Meeks hit free throws in the final seconds to wrap it up. The Lakers nursed a small lead over the Jazz (43-39) down the stretch of their tumultuous season, but Utah held the tiebreaker. The Jazz's 86-70 loss in Memphis clinched the Lakers' eighth straight postseason berth, but the Lakers still had ample reason to play hard against the Rockets, given their likely preference for facing San Antonio instead of Oklahoma City, which easily ousted the Lakers in last season's second round. Although the Lakers didn't finish in the Western Conference's top four for the first time since 2007, they still avoided the embarrassment of missing the playoffs for just the second time in Bryant's 17 NBA seasons. Los Angeles began the season with sky-high expectations after acquiring Nash and Howard, but a painfully slow start to the season got coach Mike Brown fired and threw the Lakers into a skid that didn't stop until late January, when they had dropped to 17-25. The Lakers are 28-12 since their nadir in Memphis, but even that impressive surge sometimes didn't appear to be enough to reach the postseason. They were swept by their Staples Center co-tenants, the Clippers, and struggled against most of the West's good teams - and Los Angeles' injury woes have been ridiculous, with their top six scorers and key backups Blake and Jordan Hill all enduring significant problems. Houston stayed ahead for most of the first 3 1/2 quarters with steady offense from Harden and Parsons, particularly in transition. The Lakers' personnel deficiencies showed in their second game without Bryant, with coach Mike D'Antoni even fielding a backcourt in the first quarter featuring seldom-used Darius Morris and Andrew Goudelock, signed from the NBA D-League last weekend. Houston built its lead up to 11 points in the third quarter, but Los Angeles chipped away steadily in the fourth, going ahead 81-79 on Blake's fourth 3-pointer with 6:36 to play. NOTES: Howard grabbed his 9,000th career rebound in the first quarter, becoming the youngest player to reach the mark, 14 days faster than Wilt Chamberlain. Howard, who went straight from high school to the NBA, is only the 13th-fastest in terms of games (697). ... Houston has won just one playoff round since 1997. The Lakers haven't been knocked out in the first round of the postseason since 2007. ... Jim Parsons and Johnny Galecki of "The Big Bang Theory" attended the game, with Houston native Parsons wearing a Rockets hat.